Aloe vera is a stemless or very short-stemmed succulent plant growing to 60–100 cm (24–39 in) tall, spreading by offsets. The leaves are thick and fleshy, green to grey-green, with some varieties showing white flecks on their upper and lower stem surfaces. The margin of the leaf is serrated and has small white teeth. 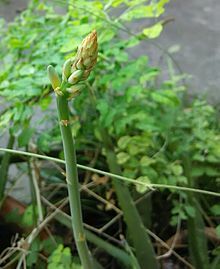 The flowers are produced in summer on a spike up to 90 cm (35 in) tall, each flower being pendulous, with a yellow tubular corolla 2–3 cm (0.8–1.2 in) long. Like other Aloe species, Aloe vera forms arbuscular mycorrhiza, a symbiosis that allows the plant better access to mineral nutrients in soil. Aloe vera leaves contain phytochemicals under study for possible bioactivity, such as acetylated mannans, polymannans, anthraquinone C-glycosides, anthrones, other anthraquinones, such as emodin, and various lectins. Spotted forms of Aloe vera are sometimes known as Aloe vera var. The species has a number of synonyms: A. barbadensis Mill., Aloe indica Royle, Aloe perfoliata L. var. vera and A. vulgaris Lam. Common names include Chinese Aloe, Indian Aloe, True Aloe, Barbados Aloe, Burn Aloe, First Aid Plant. The species epithet vera means “true” or “genuine”. Some literature identifies the white-spotted form of Aloe vera as Aloe vera var. chinensis; however, the species varies widely with regard to leaf spots and it has been suggested that the spotted form of Aloe vera may be conspecific with A. massawana. The species was first described by Carl Linnaeus in 1753 as Aloe perfoliata var. vera, and was described again in 1768 by Nicolaas Laurens Burman as Aloe vera in Flora Indica on 6 April and by Philip Miller as Aloe barbadensis some ten days after Burman in the Gardener’s Dictionary. Techniques based on DNA comparison suggest Aloe vera is relatively closely related to Aloe perryi, a species endemic to Yemen. Similar techniques, using chloroplast DNA sequence comparison and ISSR profiling have also suggested it is closely related to Aloe forbesii, Aloe inermis, Aloe scobinifolia, Aloe sinkatana, and Aloe striata. With the exception of the South African species A. striata, these Aloe species are native to Socotra (Yemen), Somalia, and Sudan. The lack of obvious natural populations of the species has led some authors to suggest Aloe vera may be of hybrid origin. The natural range of A. vera is unclear, as the species has been widely cultivated throughout the world. Naturalised stands of the species occur in the southern half of the Arabian Peninsula, through North Africa (Morocco, Mauritania, Egypt), as well as Sudan and neighbouring countries, along with the Canary, Cape Verde, and Madeira Islands. This distribution is somewhat similar to the one of Euphorbia balsamifera, Pistacia atlantica, and a few others, suggesting that a dry sclerophyll forest once covered large areas, but has been dramatically reduced due to desertification in the Sahara, leaving these few patches isolated. Several closely related (or sometimes identical) species can be found on the two extreme sides of the Sahara: dragon trees (Dracaena) and Aeonium being two of the most representative examples. The species was introduced to China and various parts of southern Europe in the 17th century. The species is widely naturalised elsewhere, occurring in temperate and tropical regions of Australia, Barbados, Belize, Curaçao, Nigeria, Paraguay, Mexico and the US states of Florida, Arizona and Texas. The actual species’ distribution has been suggested to be the result of human cultivation (anthropogenic). Aloe vera can be grown as anornamental plant. Aloe vera has been widely grown as an ornamental plant. The species is popular with modern gardeners as a putatively medicinal plant and for its interesting flowers, form, and succulence. This succulence enables the species to survive in areas of low natural rainfall, making it ideal for rockeries and other low water-use gardens. The species is hardy in zones 8–11, although it is intolerant of very heavy frost or snow. The species is relatively resistant to most insect pests, though spider mites, mealy bugs, scale insects, and aphid species may cause a decline in plant health. This plant has gained the Royal Horticultural Society‘s Award of Garden Merit. In pots, the species requires well-drained, sandy potting soil and bright, sunny conditions; however, Aloe plants can burn under too much sun or shrivel when the pot does not drain water. The use of a good-quality commercial propagation mix or packaged “cacti and succulent mix” is recommended, as they allow good drainage. Terra cotta pots are preferable as they are porous. Potted plants should be allowed to completely dry prior to rewatering. When potted, aloes become crowded with “pups” growing from the sides of the “mother plant”, they should be divided and repotted to allow room for further growth and help prevent pest infestations. During winter, Aloe vera may become dormant, during which little moisture is required. In areas that receive frost or snow, the species is best kept indoors or in heated glasshouses. There is large-scale agricultural production of Aloe vera in Australia, Bangladesh, Cuba, the Dominican Republic, China, Mexico, India, Jamaica, Kenya, Tanzania and South Africa, along with the USA to supply the cosmetics industry. There is little scientific evidence of the effectiveness or safety of Aloe vera extracts for either cosmetic or medicinal purposes. A research study finding positive evidence is frequently contradicted by other studies. Despite this, the cosmetic and alternative medicine industries regularly make claims regarding the soothing, moisturizing, and healing properties of aloe vera. Two 2009 reviews of clinical studies determined that all were too small and faulty to allow strong conclusions to be drawn, but concluded: “there is some preliminary evidence to suggest that oral administration of aloe vera might be effective in reducing blood glucose in diabetic patients and in lowering blood lipid levels in hyperlipidaemia. The topical application of aloe vera does not seem to prevent radiation-induced skin damage. The evidence regarding wound healing is contradictory. More and better trial data are needed to define the clinical effectiveness of this popular herbal remedy more precisely.” One of the reviews found that Aloe has not been proven to offer protection for humans from sunburn. A 2007 review of aloe vera use in burns concluded, “cumulative evidence tends to support that aloe vera might be an effective intervention used in burn wound healing for ﬁrst- to second-degree burns. Further, well-designed trials with sufficient details of the contents of aloe vera products should be carried out to determine the effectiveness of aloe vera.”Topical application of aloe vera may also be effective for genital herpes and psoriasis.A 2014 Cochranereview found no strong evidence for the value of topical application of aloe vera to treat or prevent phlebitis caused by intravenous infusion. 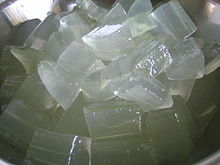 Aloe vera gel is used commercially as an ingredient in yogurts, beverages, and some desserts,although at certain doses, its toxic properties could be severe whether ingested or topically applied. The same is true for aloelatex, which was taken orally for conditions ranging from glaucoma to multiple sclerosis until the FDA required manufacturers to discontinue its use.